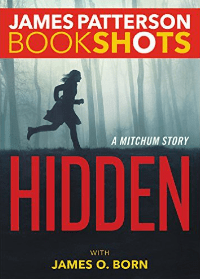 In Hidden by James Patterson and James O. Born, turned down by the Navy SEALS, Mitchum is happy to be the guy folks turn to when they need help in his small hometown in upstate New York. When his 14-year-old cousin, Bailey Mae goes missing, he sets out to solve the most important case of his career. Readers of this blog will know that I don’t care for the writing of James Patterson while my 70-year-old father is one of his biggest fans. I am; however, a huge fan of James O. Born. Many years ago I picked up his novel Walking Money while browsing library shelves and immediately after reading the novel, I set out to find everything he’d written and it was all of a wonderfully high and entertaining quality including a subsequent sci-fi novel written under the pseudonym James O’Neal. You can see how I might be torn when making the decision to read Hidden, though the book and every other Patterson novel ever written had been pre-ordered for my Dad. My Dad loved Hidden for the same reasons that he loves all of Patterson’s books. He liked the short, quick chapters and thought the story interesting and the characters creative. He liked that they were looking for a child with whom there was a personal connection and he found a number of surprises in the trajectory of the story. I agree that the story is interesting and that Mitchum is an interesting character. Born specializes in characters of questionable morality acting within the bounds of self-interest. To this reader, the short chapters are choppy and often repetitive. If I were on the line and putting down and picking up the book on a regular basis, the flow might not seem so stunted. Though only 144 pages, this “Bookshot” could have been considerably shorter and a lot cleaner. Of course, the first person has never been my favorite point of view. The story really becomes interesting in Chapter 4 when Mitchum’s brother, Natty, becomes involved. He’s a drug dealer with whom Bailey Mae has been spending a lot of time, so the natural assumption is that the life Natty is leaving has gotten the teenager into trouble. From everything we hear about Bailey Mae, she’s a kind and gentle kid and isn’t that the type to whom all of the bad things happen? She’s also the type for whom everyone will work hard and for whom readers will worry and pine which makes for the best sort of character. All involved are deeply detailed and fully developed. The almost Navy SEAL, the drug dealer and the child at risk. So is Tammy a Patterson convert? No. I still adore James O. Born, though Hidden is going to be the very bottom of my must-read Born list. If you’re looking for a really great Friday read, pick up his Alex Duarte series or the excellent Walking Money. For more information about James Patterson visit his website. You can connect with him on Goodreads, Facebook, Pinterest, YouTube and Twitter @JP_Books.